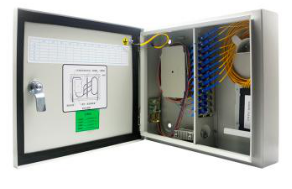 Fiber Terminal Box (FTB) generally refers to the box shape fiber optic management products used to protect and distribute the optical fiber links in FTTH Networks. SOPTO typical optical fiber terminal boxes (FTB) are with 6 ports or 24 ports, and they can be installed on the wall or pole mounted, indoor and outdoor application. The fiber optic terminatioin box is made of cold rolling steel and the surface of the box use the technique of dim blowing plastic. Our fiber optic box is typically installed with FC, SC, ST or LC adapters on the patch panel. SOPTO can provide 12 cores, 24cores, 36 coress, 48cores, 72 cores, 96 cores series of Splitter box.If you want to know more about the exact information of the specified splitter box, please contact us.